What inspired me to go to Gov. Jay Inslee’s inauguration ball on Jan. 16, even though I was sick? Gratitude. After attending Gov. Gary Locke’s inaugural ball in 1997 at the Capitol, I had no intent of ever going to another inauguration. But I changed my mind when Inslee came to the Asian Weekly’s Top Contributors’ dinner on Dec. 7. One of Inslee’s relatives told me that he was still trying to get Inslee, who had a packed schedule, to visit the company he worked for. More surprising was that Inslee invited Lena Hou, who he met at our dinner, to sing the national anthem at his swearing-in ceremony. I don’t recall Locke having anyone at the House Chamber during his swearing-in. We felt honored by Inslee’s gesture. Inslee knows how to connect with people better than many politicians. He seized opportunities that normal officials would just take for granted. 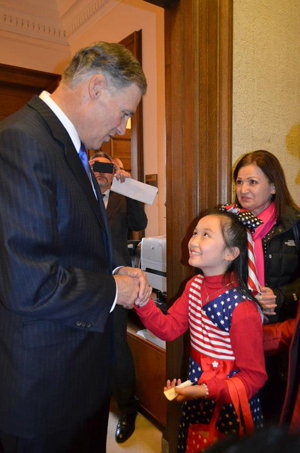 Lena Hou, a fourth grader of the Renton School District, performed the national anthem at our dinner, and Inslee recognized right away that she would be a hit at his swearing-in ceremony. Performing before an audience of over 500 state legislators and guests, Lena received two standing ovations. The first round of applause lasted nearly a minute. Afterwards, Lt. Gov. Brad Owen, who presided over the ceremony, praised Hou’s talent. The crowd instantly erupted into a second standing ovation. Hou’s family also got a chance to visit the governor’s office, and Lena sat in his chair. For a 9-year-old girl, this was perhaps the most exciting day of her life. When I went to Locke’s party, I actually paid for tickets. At the time, I was afraid that there wouldn’t be enough people going to Locke’s ball. I was presumptuous then, as 4,000 guests, 20 percent of whom were people of color, packed every corner of the capitol building. Inslee had approximately 3,000 guests, but that didn’t mean Inslee had less support. Crowds chanted “Jay, Jay, Jay” when he walked down the stairs of the Rotunda, which was lined by guards, to greet his guests. As usual, Inslee’s speech was short and sweet. Times are different. With the present economy slow and uncertain, gas is expensive and people are more careful about spending money. Each ticket cost around $100. A ticket to Locke’s inaugural ball cost around $45. Fewer guests at the ball meant that we had more food to eat and that it was easier to move around the capitol building. The room’s layout and program was better organized than before. The food tent was bigger and well designed. There was a band entertaining the audience. I left Inslee’s ball stuffed. At Locke’s, there was not enough food, and I went home feeling hungry. Was the inauguration ball only for VIPs? I didn’t know that there was a governor’s inauguration ball before Gary Locke was elected in 1997. Then the invitation arrived. The word went out to all my Asian friends that we should attend to support our first Asian American governor. No, you don’t need to be somebody to join the ball. Nor do you need an invitation. Just buy tickets. It’s good to go at least once in your lifetime for the experience. One person who would never miss a governor’s inaugural ball is attorney James Buckley. He has attended the inaugurations of Governors Locke, Gregoire, and Inslee. He is proud to display his souvenir plastic wine glasses from each event. An Inslee donor, he was pleased. He liked Inslee’s spacious tent, which was warmed by space heaters. At the ball, you could drink all the wine you wanted — it was free. Fortunately, we didn’t even take one sip. On the way home, we were pulled over by a state patrol car while heading towards the freeway. We instantly showed him our press pass, explaining that we were journalists covering the event. I even showed him the guava juice I was holding. It was dark and foggy, so we couldn’t see that the road we were on led to a parking garage, not the freeway. The officer wrote down my husband’s name and let us go without a citation. Want to read the publisher’s blog in Chinese? Visit our website at www.seattlechinesepost.com.